With the holiday season just around the corner, we’re seeing more and more homes decked out for the holidays. Wreaths on front doors, twinkle lights in the hall, even mailboxes are getting in on the action! But what about the kitchen? It’s where the Thanksgiving turkey is cooked, the Christmas cookies are baked and—if you’re anything like our households—the leftovers are decimated the day after. Families spend so much “together time” in the kitchen, so it’s nice to take the time to give the heart of the home a festive touch. You don’t need to do anything as involved as traditional kitchen renovations—all you need is a free weekend and these quick tips. Holiday ornaments. Whether kitschy ornaments, rustic garlands or elegant vignettes are more to your taste, some strategically placed holiday decor is always in style. Themed linens. Put away your everyday linens and swap them for holiday-inspired runners, rugs and kitchen towels. Deep reds and greens are traditional, but not mandatory. Edible arrangements. What’s better in a holiday kitchen than décor you can eat? Put out jars of candy canes, plates of sugar cookies or a bowl of seasonal fruit. Special china & silverware. If you’ve been hoarding fancy serveware and dinner sets for a special day, now’s the time to use them. Lighting & scents. Finish off the holiday ambiance with warm lighting and the fragrance of Christmas spices. No matter what season it is, the kitchen is always the heart of your home. If you’d like to make it look and feel special all year round, DreamMaker Bath & Kitchen of Northeast Suburban Chicagoland can help! 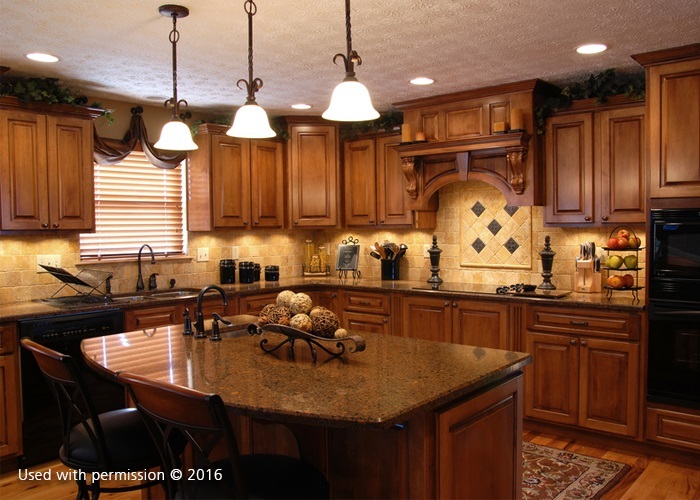 Look no further for contractors for your kitchen remodel. Connect with us today at (847) 327-0203 or through our contact form!